Please refer to our stock # 26C10 2214 when inquiring. 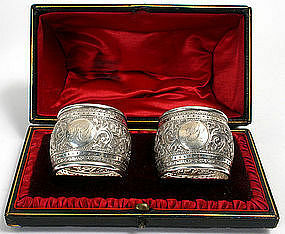 A cased pair of repousse decorated napkin rings fashioned in sterling silver by the famous late 19th century manufacturer, Henry Holland, London, 1899-1900. This pair of napkin rings are of heavy weight and are decorated all over with crisp repousse work of scrolling foliage, and each is engraved with the original owner's initials in a circular cartouche, 'JHP' and 'JP'. They are offered in their original black leather covered wooden case with hinged domed cover and red velvet and silk fitted interior. Some minor damage to one end of the case. Napkin rings are in pristine condition and fully hallmarked, including the maker's mark of Thomas, Walter and Henry Holland. Size: 1 3/8" wide x 1 3/4" diameter.